This article is a short summary of Animal Crossing: amiibo Festival. 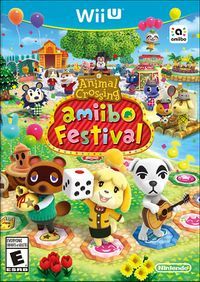 Animal Crossing: amiibo Festival is a spin-off board game-style party game in the Animal Crossing series, similar in fashion to the Mario Party series. The game is based upon Animal Crossing: New Leaf, and features many of the series' characters as the playable cast, accessible by using amiibo figures. The game was launched exclusively as part of a retail bundle with the Isabelle (Winter Outfit) and Digby (exclusively available with the bundle at launch) amiibo figures, and three exclusive amiibo cards: Rosie, Goldie, and Stitches. Explore a board-game town with Animal Crossing characters! Collect Happy Points and Bells in an Animal Crossing board-game town. Your amiibo™ figures become your game pieces. Play eight minigames using amiibo cards. 1-4 players, 1-6 amiibo cards. The main gameplay is similar to most Mario Party games. Players tap their Animal Crossing amiibo to determine which character they will be before playing. Players spend one month in the village and move around the board by rolling a die, the goal to collect the most "Happy Points" by the end of the game. Players are also given Bells, the currency of the Animal Crossing series, which they can gain and lose by landing on certain spaces. Events may also happen at various points in a game. A set of minigames is also available, which can be unlocked with Happy Tickets earned by playing the main game. The minigames use the Animal Crossing amiibo Cards to play rather than the figurines. Using the Animal Crossing amiibo cards, players can transfer their animals' homes from Animal Crossing: Happy Home Designer. ↑ Post by Nintendo of America on Twitter. Retrieved July 10, 2015. This page was last edited on 7 December 2016, at 19:43.